It's nice out, so why not go to your local basketball court today for your cardio. * The "left over" time in that minute is rest. **** If you complete 5 Burpees and a sprint in 40 seconds that's means the remaining 20 seconds in that minute will be used to rest. Once the next minute begins, you start again. Sometimes it's hard for me to not compare myself to others. It's so easy to compare yourself with others, and all it leads you to is frustration and disappointment. I have struggled with doing this my whole life. I never could wrap my head around why people are built differently, and why some people are better than others at certain things. Yesterday was a rough one, I was chatting with my mom on a road trip and I sort of had a pity party for myself. She was there to listen and support and that's all I wanted (yeah I purposely asked her to not give me her thoughts, I just needed to vent). After I talked it out, I went home and on a long run. I realized that I just need to continue being me. I like me. I like that I have I work harder than some other people I know, because the pay-off of all my hard work is worth it! 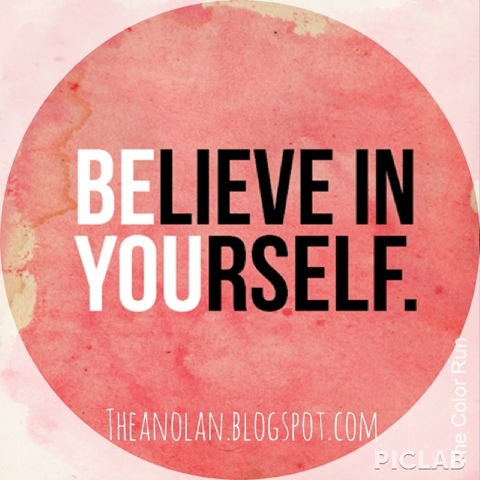 Be you, and own it! My cousin Brian (@brian_wagner) is a total foodie. He works for Nugget Market, and in his free time outside work explores cool food spots and likes to cook. We were at a family reunion this weekend, and I almost died when I saw something bright and fresh in the kitchen! I told Brian I had to try his salad, and once I did I knew it had to be on my blog. Here it is! 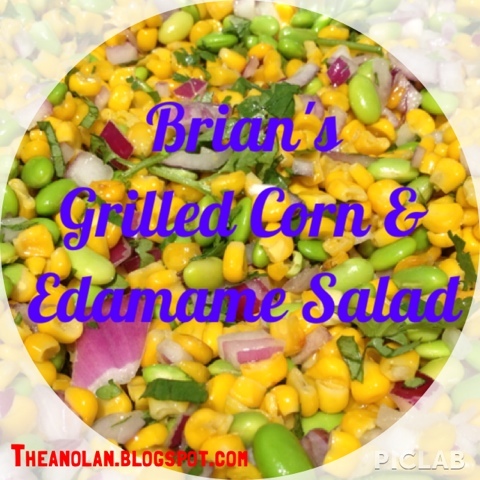 Brian's Grilled Corn & Edamame Salad! 1. Throw all ingredients into a bowl! 2. In a smaller bowl whisk together dressing items. Brian says, "I always make the dressing to taste." It's that simple! I tried it, it really is delicious! I often hear from family members, friends, clients, and strangers that they "don't have time" for the gym. I sympathize with them, and definitely agree that it is TOUGH to get in daily workouts. When you work full time, might be in school, have kids, etc. Guess what... Although I understand; those are ALL excuses! Yeah, I said it!! Stop handicapping yourself and using excuses to continue on your path of being lazy. If you are telling me you want to go to the gym more, then stop saying it and start DOING it. One reason many people might read this and immediately assume I don't understand is because I'm young, single, and work at a gym. These are all true, but I am up at 5:00am to shuttle to work, I am on my feet from 7a-4:30, and after work I shuttle home and get back by 6. My workdays are long, but I STILL MAKE TIME. Another reason I don't want to hear excuses are because my dad and mom both juggled it my entire life! Yes these two humans raised three children, have full time jobs, and workout DAILY! My dad works 60+ hours a week and continues to win World Championship Gold Medals for cycling. It's true you MAKE time for things that are important to you! After meeting many executives, millionaires, and business owners I noticed a trend. They all workout regularly! This gives them the energy to take on their busy schedules. Next time you give yourself an excuse, try to rethink it, and focus on "YOU" time. It's summer! We are more tan than usual, so it's time to whip out those bright polishes! 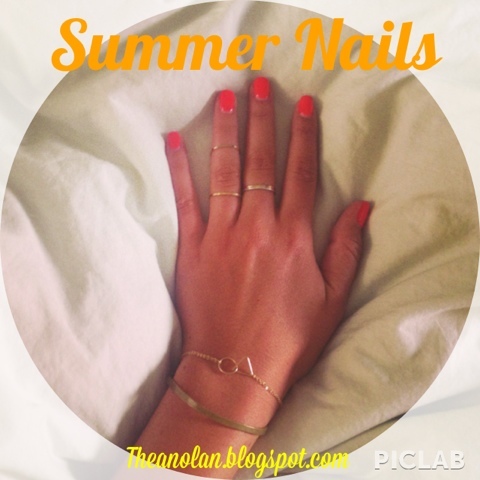 A solid fun nail color can be a huge accessory during the summer months, so take advantage! Yesterday I made up a really good beach workout! It was a total body burner, and you can perform these exercises anywhere! The gym, the beach, outside, on grass, wherever you want! Start with 5 minites of stretching. Complete circuit #1 three times before moving on to circuit #2. I hope you break a good sweat! It is hard to get greens in your diet when traveling, so I make sure to pack some treats in my bag in order to make sure I have healthy options. In my post a few days ago I mentioned some of my groceries I bring, and today I used a lot of them! 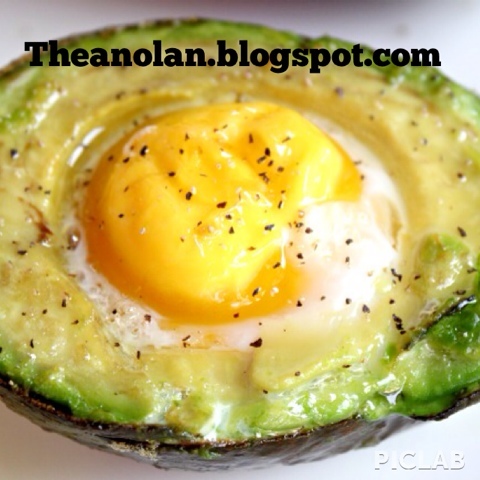 Try this recipe, or make one with different ingredients that you enjoy! As I mentioned it isn't easy to eat clean on vacation, but if you prepare it's do-able! Enjoy your treats, but also eat mostly healthy. We went on a hike and tubing adventure for half the day to keep active! I also drank water all day long!! 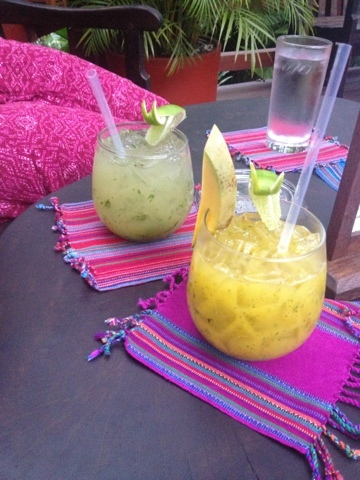 While traveling it is super easy to fall off the wagon! Don't get me wrong, vacation is time to let loose. That doesn't mean your should go hog wild and stop exercising, eating healthy, and drink a ton. You can let loose, have fun, and not give up all your healthy habits. 1. 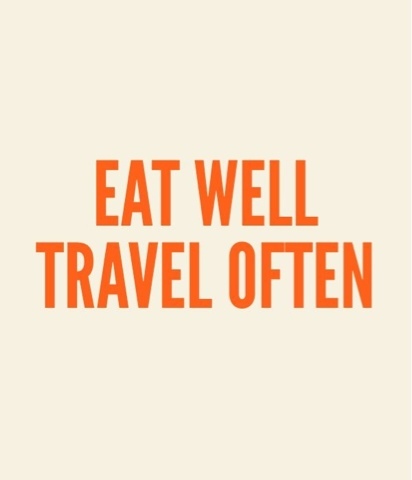 Pack healthy snacks to fly or travel with. 2. Go grocery shopping when you get to your destination. 3. Do workouts you typically wouldn't do. If you are use to lifting weights try paddle boarding, yoga, running, hiking, snorkeling, etc. 4. 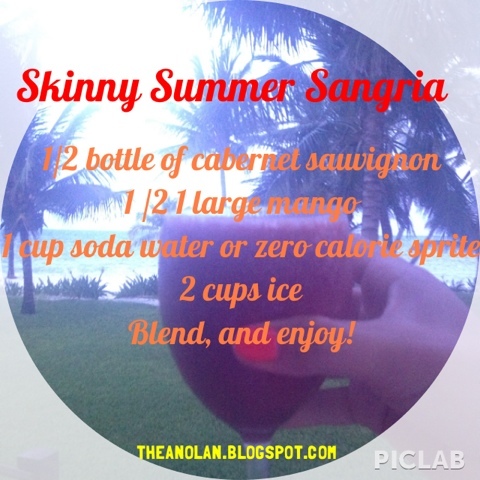 Drink less caloric beverages. Ask for the skinny version of whatever drink you desire! 5. Stay hydrated! Drink tons of water!! 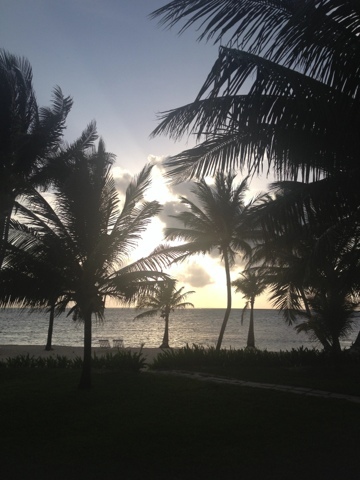 I'll post about my Belize trip to show you how I ate! It's that time of year! 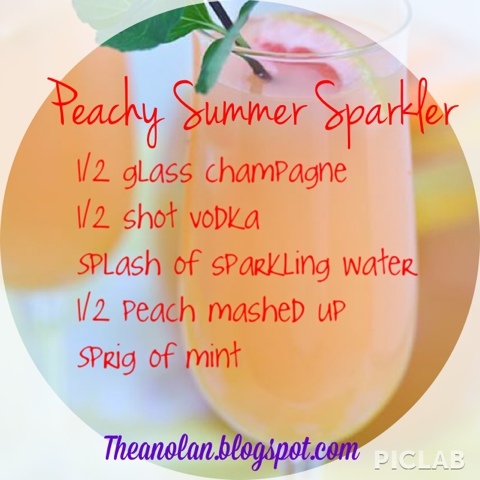 It's warm out, and cooling down with a Skinny Spritzer might be the way to go! 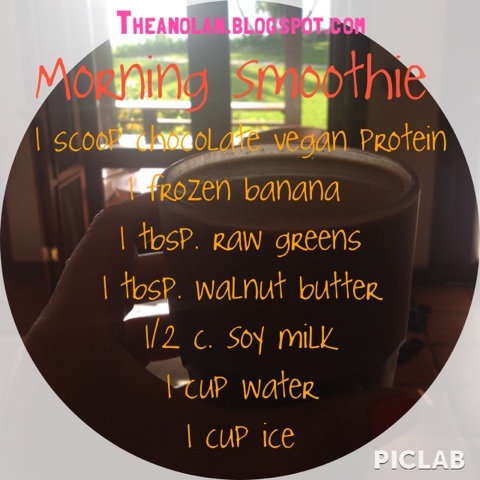 - Green Smoothies: there are so many varieties you can make. 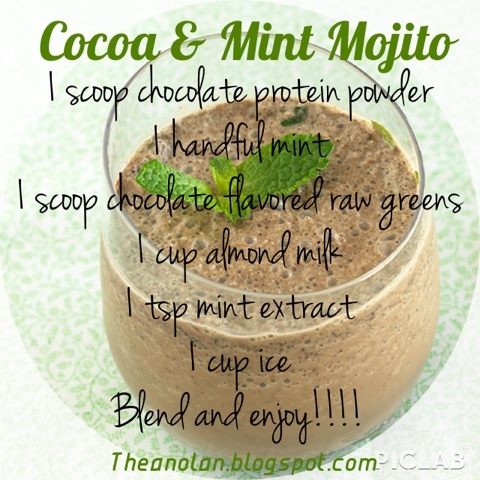 They are so fast to make and drink on the go! Green smoothies are my favorite, because they can be whatever you want them to. My favorites are these. Here's another. -Hummus and veggies: I love packing veggies and hummus in my purse when I am running around. A cup of veggies (carrots,cucumber, tomato, beets, califlour, broccoli, bell pepper, etc) always goes well with some delicious hummus. You can make your own, or go to a health food store and stock up on your favorite organic hummus. Make this one, or this one at home. - Fruit with chia seeds: Chia seeds are great to throw in to your diet. They are packed with nutrients like omega-3 fatty acids, carbohydrates, protein, fiber, antioxidants, and calcium. Soak your chia seeds in water then you can top them on your favorite fresh organic fruit! My favorites right now are a combo of plums, peaches, nectarine, and mango. 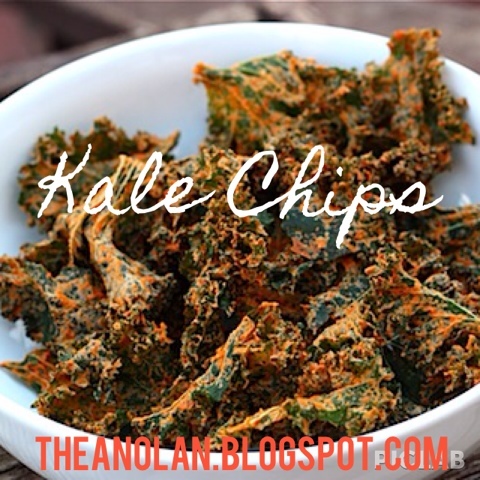 -Kale chips: I have been obsessed with kale chips lately. I have made them at home, but have also tried these and these and have been completely blown away by how tasty they are! These are filled with fiber and nutrients so stock up! - Nut butter and fruit: sometimes keeping it quick and simple is the way to go. I love grabbing an apple or banana and spreading a nut butter on it. Lately I've been trying new kinds of nut butters, and my favorites are walnut, cashew, and pecan. -Hard boiled eggs: if you hard boil some free range organic eggs and keep them in your fridge, they can be the perfect grab-and-go along with nuts or a piece of fruit! I recently cut out meat from my diet, just to see how my body responded. I want to test how my energy levels are, how my workout intensity is, and simply how I feel. Well surprisingly, a few weeks in to not eating animal products I started craving fish out of all things. I really try to make sure I listen to my body, so I decided to hit up whole foods and stock up on some yummy organic fresh fish. 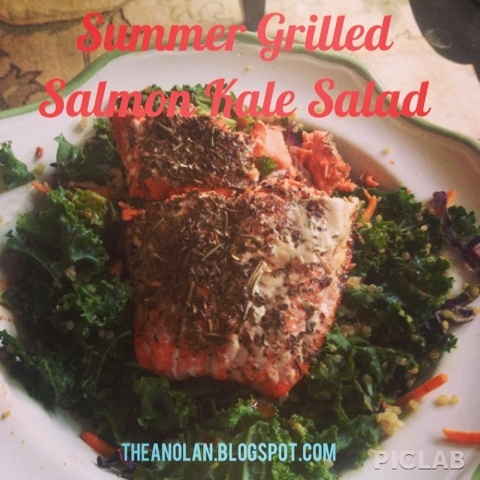 Today I decided to make a kale salad with a nice filet of salmon! 2. Bake salmon for 20-30 mins (I seasoned with cumin,paprika,Italian, and basil). 2. In a bowl toss kale, lemon, and avocado with your hands. This allows the kale to soften and moisten. 3. Sprinkle on quinoa, and seeds. 4. Top salad with your baked salmon.